Not to bury the lead. . . The Handel and Haydn Society Chorus, conducted by Harry Christophers, delivered a stunning performance of J.S. Bach’s Singet dem Herrn, BWV 225 in Symphony Hall last Thursday night. Singing the double choir motet after the unaccompanied Palestrina, the musicians delivered power when required, joined always to always grace. Opulent tone, nimbly deployed, gave a transparent texture that allowed the detailed counterpoint to speak. Individual lines stepped to the forefront when approaching cadences, but they always sang the resolving note more quietly, allowing the musical momentum to carry elsewhere. I have known and loved this work for decades, yet I still “discovered” a phrase in the tenors that was new to me because of the impressive H & H reading. Tempos were fleet, bordering on daring, especially in the final triple meter section (not many ensembles could make such a brisk tempo work effectively!) and the final cadence was appropriate: graceful without being sentimental. In short, when this motet ended, I and many of the choral professionals in the audience wanted to hear it again. . . or perhaps, for the performers to turn the page and go on to BWV 226. “Handel and Haydn Sings” was given in conjunction with the national conference of Chorus America, one of several professional choral organizations in the United States. Therefore, alongside the regular local audience, Symphony Hall was packed with conductors, singers, and staff from choruses around the country. The eclectic concert included one coronation anthem and Part III of Messiah by Handel, a world premiere by Gabriela Lena Frank, two Palestrina motets, the Bach motet, and two contemporary motets, one each from Arvo Pärt and James MacMillan. Arvo Pärt’s The Deer’s Cry, a devotional text from circa 377, was minimalist not in the incessant American style, but thoughtful, almost monastic repetition of a sequence of minor harmonies—the type that make the arrival of a major third a gratifying endorphin rush. Once again, the technical prowess of H & H in tone and intonation elevated this “Cry” very satisfyingly. It may not be clear, and we may not all agree, the degree to which disclosure of relationships is necessary for a review such as found on this blog/journal. In this case, reviewing one of Boston’s most venerable institutions that is nonetheless composed largely of freelancers (more on that later), I counted friends, classmates, and teachers on the stage. I sat next to an H&H staff member in the audience, and I had volunteered for the organization earlier in the week. I smiled at the memory of one of the soloists sitting on my living room floor, squeaking a musical octopus for the benefit of my one year old (although who was more delighted with the toy is a matter of debate). However, my only connection to Harry Christophers came from receiving some of his CDs as a young man and having my head spun around. Christophers’ conducting style is always engaged, usually delineating a phrase, always moving but in an unfussy way. The Palestrina motets (Vineam mean non custodivi and Pulchrae sunt genae tubae, both texts from the “Song of Solomon” for those keeping score at home) were lovely, the conductor aiding the push and pull of the polyphony. During a Messiah chorus, he took a little exuberant walk while the chorus sang of resurrection. It is novel to experience Part III on its own. I was gratified to hear soloists from within the ranks of the chorus singers. Sonja Tengblad offered a gracefully ornamented “I Know That My Redeemer Liveth” while Margot Rood navigated “If God is for us” with bright, sparkling tone. The duet of Emily Marvosh and Stefan Reed featured crystal clarity and, atypically, a contralto voice nearly covering up a powerful tenor who seemed to be held back. “The Trumpet Shall Sound” is an assignment that can strike fear in the hearts of baritones and trumpeters alike; the formidable baritone was David McFerrin. He stood at the opposite corner of the stage from Baroque trumpeter Jesse Levine, and the balance between the two sonorous instruments worked well until, vexingly, McFerrin was swept away by an exuberant violin section in the closing measures. Now, a curmudgeonly note from this cranky choral director. 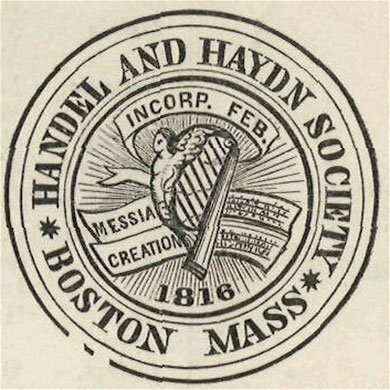 While the 200+ history of the Handel and Haydn Society is impressive and it certainly deserves its plaudits, the celebration of the bicentennial reminds me that this organization has made fundamental changes in its mission and identity (indeed, maybe an organization must do so to flourish for two centuries). When H + H became a period instrument ensemble, it also slowly ceased to be a consistent volunteer choral organization wagging a pickup orchestra; in recent decades it became an instrumental ensemble with a chorus attached. Irrelevant quibble? Maybe. Certainly the appointment of Harry Christophers brought renewd focus on choral music at the center of the society, but the organizational reality is stark: the orchestral players are tenured, the singers are not. Anyone who reads my words above will understand I am not complaining about the quality of the musicmaking from the singers. It is exceedingly fine! I think of the freelance situation because some professional choruses around the US are experimenting with new models, including several all-star choruses. These groups fly in their singers from around the country for short residencies, usually with stellar musical results. Many of Thursday’s singers take part in such arrangements. But as this and hybrid approaches grow, what does it mean for the Poughkeepsie Chorus if most of the singers or even the conductor are not part of that community? The outstanding singers of H + H are largely fixtures on the Boston scene—I had the pleasure of hearing several of them in another rehearsal just hours before—but not all of them. Boston as a hub of learning and culture may seem to have an inexhaustible supply of freelance musicians who can make music at such a level, but how would local support for Boston’s own Handel and Haydn Society fare if the singers were all New York freelancers? This structure in H + H may not bother others, but wouldn’t it be something for Boston’s oldest musical organization to break some new ground in the treatment of professional singers? Finally, speaking of the choral community, the educational outreach arm of Handel + Haydn was part of the concert as well. About 35 high school students took part in the opening work, Zadok the Priest, with the ensemble and chorus. I especially appreciated how Christophers did not give away the entrance too early: the reserved and dignified string introduction was met with an explosion of choral sound that literally caused a few nearby to jump. The young ensembles then performed admirably in a solo selection, the men conducted by Dr. Kevin McDonald and the women by Alyson Greer. Despite the constant need for music advocacy in our schools, do not believe the hyperbole that music education is dying. McDonald and Greer lead well-respected choral programs in Wellesley and Westboro, respectively, and other quality programs exist all over the area, in Brookline, Milford, Lexington, Hingham, Belmont, Sharon, Northboro, and many others (my list is naturally subjective and incomplete). The crucial support works at the town level, and citizens of the abovementioned have demanded that arts education be a priority.